Photo by Astrid Van Ginneken. J40 catches a salmon off False Bay. When tourists visit our region, it doesn't take them long to notice that our local Killer Whales are important to us. Whale images adorn everything from thimbles to sides of buildings, and figure prominently in local indigenous culture. We keep hopeful eyes out for them on our ferry crossings and go on whale watching excursions. The Killer Whales may be wild, but they swim and live along side of us, we boat and kayak in their habitat and hope that they will grace us with their presence. Those of us who live in the region love our local whales, and we love that they are unique to this area. Many of our visitors, though, are familiar with orcas only from marine parks or from televised nature shows – and while there may be merits to those experiences, neither fully encompasses the range of adaptation and behavior shown by the species. The marine parks teach us how smart the killer whales are, and explain that the tricks they perform are variations of natural behavior. The nature shows tend to focus on dramatic footage of Orcas chasing, toying with, and killing seals, penguins, dolphins, big whales or their calves. Frightening stuff for most of us. But that is only part of the picture. In contrast, our familiar resident Killer Whales just eat fish, invertebrates, and who knows, maybe the hapless sea bird or bit of kelp…but no seals, no sea lions, no dolphins or whales. And there is no record of them ever harming a human being, in spite of the treatment they have received at our hands. There are other groups of Killer Whales that visit our region that do eat seals and other marine mammals, but they tend to come and go, and our local whales do not associate with them. It is a really important distinction – the mammal eating whales are referred to as "transients", and will have names that begin with "T". Our familiar Killer Whales, on the other hand, are "residents". They live in the Puget Sound and the surrounding inland water (called the Salish Sea) during the spring and summer months, and can be seen infrequently the rest of the year. 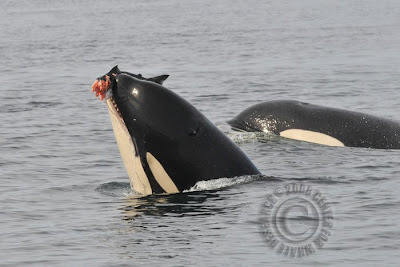 As a group they are referred to as "Southern Resident Killer Whales" (SRKW) and their individual family groups, or pods, start with the letters "J","K", or "L". (The naming system began with a Canadian researcher, Dr. Michael Bigg). Each one is given a number, according to when it was first identified. So when you hear that J, K or L pod is around, those are the Orcas that live here. The ones that love fish and can pick out a Chinook salmon in a school of Sockeye with their eyes closed (they use sonar and can tell by the size of the fish's swim bladder!). They are the ones that swim up and down the west side of San Juan Island, in what the researchers call "The Westside Shuffle". The ones that come so close to the shore that it feels like you could reach out and touch them, the ones that love to drape kelp over their backs and tails and drag it along. The ones that poke their heads up and watch us watch them, and surface gently or spectacularly next to our boats. Those are our Orcas, as unique to us as the "sandals and socks" guy on local ads. Entrenched in our culture, Killer Whales are icons of the Pacific Northwest, and with enough clean healthy fish to sustain them our new baby Killer Whales may chose to stay and live their lives here, joining in the Westside Shuffle, watching us watch them. Of course, not only are Killer Whales not killers, they are not whales either.